Wallpaper designer Kate Golding celebrates her 38th birthday by tackling the North Head Trail in St John’s. Canadian wallpaper designer Kate Golding loves to draw on location with an old-fashioned sketchbook. Her best ideas have come from exploring the wonders of nature, architecture, people and unique experiences. We caught up with her during a recent trip to Newfoundland, where she was on a creative mission for her new collection. "It is amazing when you see something in life and create a design from it. 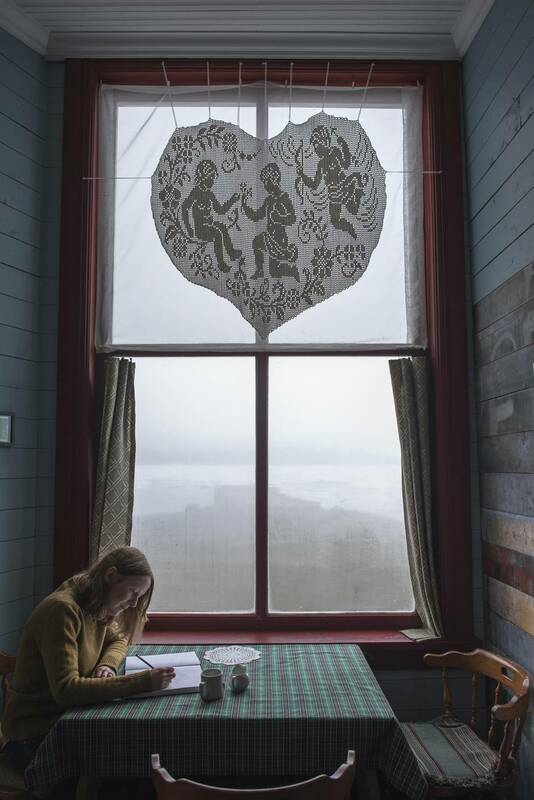 People are able to experience the magical feeling you felt when you first found that inspiration," says Golding, who sketched her way through St. John's, the Bonavista Peninsula and Fogo Island in search of designs to bring back to her studio in Ontario's Prince Edward County, and that will eventually be showcased on walls in rooms across Canada. View of St John’s harbour and salt box houses at the North Head Trail at Signal Hill in St John’s, Nfld. Hike the North Head Trail on Signal Hill. Visit Cape Spear, the most easterly point in North America. Head to George Street to listen to traditional Newfoundland music and drink a pint of Quidi Vidi Iceberg beer. The scenic and historical coastal trail on Signal Hill is one of the most famous areas in Canada. "This [was] my first time visiting the Rock," says Golding, who studied art in England. "It reminds me of my British heritage; coastal paths, wind in my hair, fresh fish, hearty, hard-working people and the most spectacular scenery." Golding walked a small section of the East Coast Trail, setting out from Cape Spear. "I hiked in what felt like gale-force winds along the cliffs, where I felt a connection to the rich history of the area and the ocean beneath me." Wallpaper designer Kate Golding celebrates her 38th birthday on the North Head Trail at Signal Hill in St John’s, Nfld. Beyond the vistas was a culinary extravaganza of locally sourced produce, accompanied by a soundtrack of fiddles and flutes. Her favourite restaurant? The Adelaide Oyster House. "The place was rhythmic and alive," Golding says. "It was an amazing way to start a creative adventure." Golding looks out at the frozen Atlantic at Cape Bonavista, Nfld. Hike the Skerwink Trail near Port Rexton and Trinity East. Meet Jon Joy (tuckamorediscoveries.com) and go on an Eco-hike to see puffins, learn about the geology and plant life. Head to Neil’s Yard and Walkham’s Cafe in Bonavista to meet locals and warm up with hot tea and hearty food. "The Bonavista Peninsula in Newfoundland has a unique and lively landscape; it was a spiritual experience," Golding says. "Beneath a moving carpet of fog is hidden a rugged coastline that sets a baseline for a beautiful palette of glacial blues and lichen in pale pinks, greens and electric yellow." Golding says it wasn't unusual to see bald eagles hunting, puffins coming to shore and inky black ravens feeding their babies. She had a special encounter with a rusty fox whose coat was the same colour as the grasses he travelled. Neil's Yard Cafe in Bonavista's historical Mockbeggar Plantation district was a favourite place for Golding to sit down to sketch during the day. The café is housed in the original Roper's Shop and Fishmonger building, with signatures from fishermen dating back a hundred years covering the walls, and an amazing view of the harbour. In the evening, she listened to local musicians, enjoyed rib-sticking food and washed it all down with a Quidi Vidi Iceberg beer or two. Golding sketching at one of the artist studios owned by Fogo Island Inn on Fogo Island, Nfld. Hike the Lion’s Den loop. Find the four stunning artist studios dotted around the island, designed by Saunders Architecture (saunders.no) Bridge Studio in Deep Bay, Squish Studio near Tilting, Tower Studio in Shoal Bay and Long Studio in Joe Batt’s Arm. If you’re not staying at the Fogo Island Inn (fogoislandinn.ca), make a reservation for lunch. Priority for the dining room is given to hotel guests so it is best to contact the inn three days before your arrival to get a table. "Taking the ferry from Farewell to Fogo Island is like entering a gateway to a place you know is special, but you don't realize just how special until you get there," Golding says. Golding studying mosses near an artist studio owned by Fogo Island Inn on Fogo Island, Nfld. The colours of Fogo Island are a feast for the eyes, she says. "Clear blue skies filled with sea birds, pink rocks with black, green and yellow lichen and the deep red of the seasonal pitcher plants beginning to appear in the boggy grasses." While hiking the many coastal trails, Golding observed gannets and kittiwakes as well as magnificent wild caribou on the rugged landscape. Perfect for sketching. "Fogo Island will always retain a little piece of my heart," she says. A fish house at the shore of Bonavista, Nfld. Air Canada flies from Toronto to St. John's, Nfld. Rent a car at the airport. Drive from St. John's to Bonavista (3 hours, 20 minutes). Take your time to enjoy the scenery. Avoid driving after dark due to the large number of moose that can walk onto the highway. Drive from Bonavista to Farewell to catch the ferry to Fogo (3 hours 45 minutes). Take the scenic route. Plan to arrive early for the ferry from Farewell to Fogo, leaving plenty of time to get in line and allow for possible weather delays. Fly home out of Gander Airport: it's a design masterpiece. Find Jerry Cramm, the commissionaire, to ask for a tour. Spillars cove in the distance at dusk in Bonavista, Nfld. Go for the great food and amazing atmosphere. It doesn't accept reservations so arrive early and request a seat at the bar. Favourites include the variety of freshly shucked oysters with beautiful condiments, sticky hoisin chicken wings, spicy octopus with crunchy peanuts served in lettuce wraps and Kung Pao cod cheeks. Check its online schedule and try to catch "The Irish Descendants." Great atmosphere, dancing and a good mix of locals and tourists.